Last seen in Australia in 2012 supporting City and Colour, Afie Jurvanen, Canadian musician and collaborator with Feist, Weather Station and many more incredible artists returns as Bahamas with his full band and Polaris Prize nominated, JUNO award winning third album Bahamas Is Afie for an Australian tour this September and October. Interestingly, Afie Jurvanen isn't from the Bahamas. He is actually a Finnish-Canadian from the freezing cold working class town of Barrie in rural Ontario but his chosen epithet is fitting because since 2009 he's been making music under the name Bahamas - writing songs about sunsets, love affairs and making out. Through his simple arrangements, deft delivery and direct approach, he charts an escape route from the snow belt to the coral reefs. Across three ridiculously good albums (Pink Strat, Barchords and Bahamas is Afie) Afie has consistently delivered glorious, perfectly crafted and played songs with a charm, cheek and finesse that’s impossible not to love. 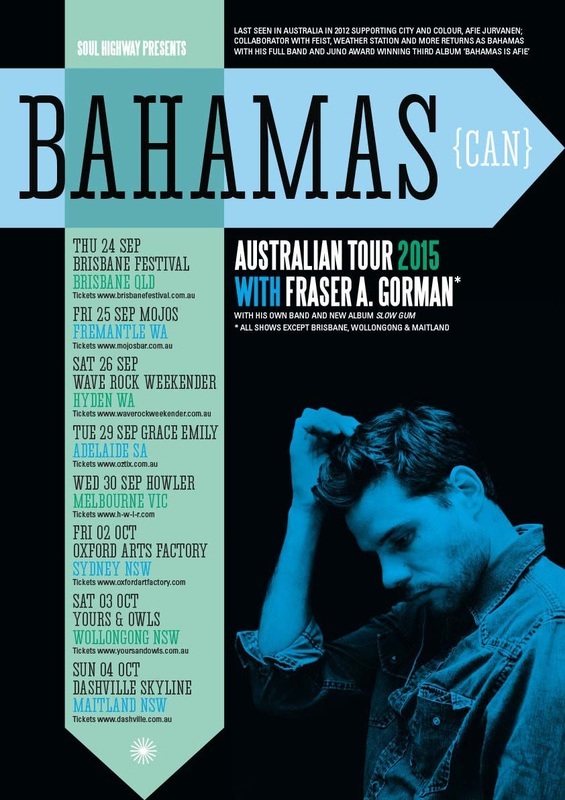 For those yet to bump into these musical delights, Bahamas is a joyful blend of all the good bits of indie folk, pop and rock that should absolutely not be missed live or on record so we are very pleased to announce that Bahamas will tour Australia in September/October 2015 with his full band for the first time. They will be appearing at three of Australia’s best regional boutique festivals, the prestigious Brisbane Festival and a string of headline shows. Joining Bahamas for the headline shows is the indelible, incredible and edible Fraser A Gorman with his band who’ll be touring his excellent new long player Slow Gum.